What Else Can I Expect from an Online Fire Science Degree Program? Fire science is the study of fire and the tools used to contain it. This discipline also covers laws, building codes, and other measures designed to mitigate fire-related threats and damages. Most fire science professionals specialize in urban and structural fires, although many also study forest fire prevention and suppression. The educational requirements for fire science professionals vary, and many positions do not require a college degree. However, many aspiring fire science professionals choose to enhance their career prospects and increase their marketability by pursuing a bachelor's degree in fire science. The coursework in most fire science programs includes material from chemistry, environmental science, and natural resource studies, along with criminal justice for arson and other fire-related crimes. Fire science majors also study local, state, and federal regulations for firefighting, resource protection, and handling and disposing hazardous materials. Many agencies and organizations that employ fire science degree-holders require their employees to earn additional credentials, such as EMT certification, and most top online fire science degree programs allow students to earn certifications as part of their coursework. In addition, fire science programs often include internship or practicum course components These opportunities allow students to receive supervised onsite training from experienced professionals. Read on to find out more about what students learn in a fire science program, and what kind of career opportunities you can pursue after earning your degree. WILL AN ONLINE FIRE SCIENCE DEGREE PROGRAM PROVIDE ME WITH THE SKILLS I NEED TO ADVANCE MY CAREER? An online bachelor's in fire science degree program covers fundamental concepts in fire prevention and emergency management. Classes address fire scouting and identification tactics, containment techniques, and post-suppression analysis. Many fire science programs address urban and forest fire behavior, allowing students to learn about both fields. Programs with internship components provide candidates with practical experience. WILL AN ONLINE FIRE SCIENCE DEGREE PROGRAM WORK WITH MY SCHEDULE? Online fire science bachelor's degrees offer a flexible alternative to traditional, brick-and-mortar classes. Students can access lectures and other course materials online, submit written assignments, take exams, and communicate with professors on their own schedule. They can study away from their home computer using a laptop, tablet, smartphone, and other Wi-Fi-compatible devices. For additional convenience, students can usually coordinate internships or practicum courses at a location near their residence. WHAT JOBS CAN I GET WITH MY BACHELOR'S IN FIRE SCIENCE? Students who graduate with a degree in fire science are qualified to take on most entry-level jobs in the industry, along with some supervisory roles that are normally reserved for candidates with a formal education. Common career pathways include firefighting, fire inspection, and emergency management. Those with an EMT certification and a background in first aid may also be considered for emergency services positions. WHAT ARE THE BEST ONLINE FIRE SCIENCE DEGREE PROGRAMS? Choosing a program is an incredibly personal decision, and only you can determine whether a program matches your educational needs and career goals. 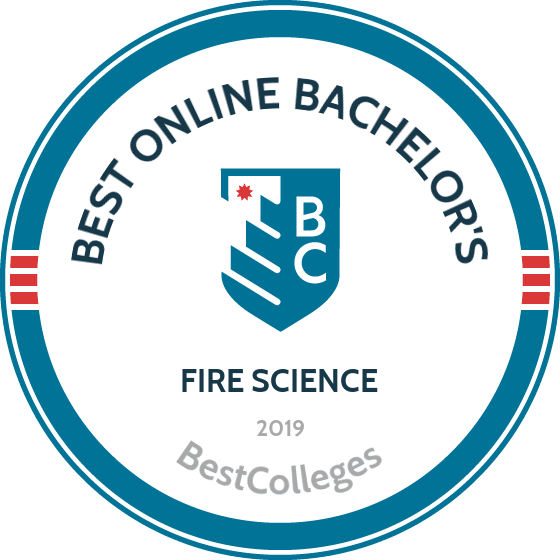 The following ranked list of schools should serve as a helpful starting point in your search for the best online bachelor's in fire science programs in the United States. If you are considering going back to school for a bachelor's degree in fire science and value the flexibility that web-based degrees provide, be sure to take a look at these top online college programs. The University of Florida launched UF Online in 2014 to offer flexible, web-based undergraduate programs. Today, UF's online students can choose from 20 majors including fire and emergency services. UF Online's BS in fire and emergency services prepares emergency services professionals to take on managerial and leadership-oriented roles. Students complete the program in an asynchronous and self-paced format. Students can specialize in fire science, emergency medical services (EMS), or emergency management. Fire science students study topics like fire prevention and protection. EMS learners explore areas such as EMS systems and mass casualty accidents, while emergency management students consider disaster policy, terrorism, and personnel management. Regardless of specialization, students take core courses that cover areas like disaster planning and control, public information and community relations, and leadership and management. A core course in communications and information technology teaches students about satellite communications, global positioning systems, intranets, and other tools on which emergency service personnel rely. Freshmen applicants and lower-division transfer students need a "C" average in high school along with a 2.0 GPA in any postsecondary work. Prospective students who graduated high school less than five years ago must submit ACT or SAT scores. Transfer students looking to progress directly to upper-division coursework need at least a 2.3 GPA and 60 transferable credits. They do not need an associate degree, but they do require certification, internship experience, professional experience, or undergraduate coursework related to their area of interest. The fire specialization only accepts transfer students with at least 60 credits. Established in 1819 as Cincinnati College, the University of Cincinnati is the oldest higher learning institution in the city. Among the largest universities in Ohio, UC enrolls close to 46,000 students through more than a dozen colleges and schools. Distance learners can choose from 14 undergraduate options, including a BS in fire safety and engineering technology. The fire science bachelor's degree requires 120 credits split evenly between lower-level and upper-level coursework. Bachelor's students satisfy nine credits of upper-level requirements through their choice of coursework in mathematics, data analysis, problem-solving, database management, and computer applications. They also take 24 credits of core fire science courses that cover topics including firefighter safety, risk management, emergency services administration, and public fire protection. Students finish the program with a capstone course in leadership and ethics that readies them for management roles. The capstone course develops students' critical thinking and relationship management skills. UC delivers most of the program's courses in accelerated, seven-week sessions, though students may also take 14-week classes and some hybrid courses. Hybrid courses include two-day residencies along with online components. Online classes typically include three assignments, each consisting of several essay questions based on assigned readings. Online courses also generally require a final exam or project. Transfer students must complete their lower-level coursework at an accredited college and hold a 2.0 GPA. They also need to take at least 60 credits through UC's College of Engineering and Applied Science. UNC Charlotte is a public research institution established in 1946. The school offers online master's degrees, graduate certificates, teacher licensure programs, and bachelor's degree completion programs. The online BS in fire safety engineering technology covers both the technical and nontechnical aspects of fire safety. The curriculum includes a course on industrial hazards and electricity, which details common hazards including compressed gasses, biotoxins, radiation sources, and rotating machinery. A course in fire safety problem analysis explores strategies for calculating heat transfer, estimating flame spread, and approximating heat release rate. Several courses in the program ready students for management or leadership roles. Learners take a one-credit professional leadership seminar where they explore effective leadership strategies through role-playing activities and case studies. A course on state and local government introduces students to key policies and issues in the United States. Additionally, learners explore group dynamics, organizational culture, and organization development through a class on organizational psychology. UNC Charlotte supports distance learners in several ways. Students can call a toll-free technical help desk that boasts evening and weekend hours. Distance education students can consult with a librarian assigned specifically to help online learners. Plus, learners can ask for logistical and administrative assistance from distance education program managers. Applicants must hold an AAS degree in a related field to qualify for admission. They need a 2.0 GPA and must be in good standing at their current school. Transfer students must complete 61 credits — 49 credits of major courses and 12 general education credits — to earn the bachelor's degree. Founded in 1871, the University of Wisconsin-Oshkosh is a public institution that offers close to 200 majors, minors, and emphases. The school boasts a bachelor's degree completion program in fire and emergency response management, serving as the first online program in the country to receive accreditation from the International Fire Service Accreditation Congress (IFSAC). The program prepares students to oversee public health and safety organizations. Bachelor of applied science students select an emphasis in fire service management or emergency management. Either way, they complete 75 credits from general education courses and emphasis classes, though students often transfer at least 15 general education credits from their associate coursework. Some unique courses include mentoring for emergency services personnel, conflict resolution for the emergency services, and politics of emergency management. UW-Oshkosh delivers the BAS in fire and emergency response management fully online through asynchronous courses. Learners take classes in accelerated, seven-week sessions and finish the degree in around two years. The university administers online classes through Canvas. Applicants qualify for admission through two main paths. Students may apply after finishing a fire service-related program, such as a wildland fire science degree online. Alternatively, the program also accepts students without an associate degree who hold at least three years of experience in the field. Professionals need to submit two recommendation letters — one from their Chief and one from a colleague. Associate degree holders can transfer in up to 90 credits. Founded in 1926 as a flying school, Embry-Riddle Aeronautical University is a private institution specializing in aviation and aerospace. The university educates around 30,000 students through two campus locations and ERAU Worldwide, which offers online programs like a BS in emergency science. Emergency science students can choose a specialization in aviation emergency management or fire and emergency services. Aviation emergency learners explore areas like aircraft accident investigation, airport emergency management, and aviation safety. Students pursuing the fire and emergency services emphasis learn about emergency response administration, community risk reduction, and leadership. Regardless of specialization, learners complete 120 credits through general education courses, electives, and specialization classes. They take 36 credits of general education courses in communication, humanities, science, mathematics, and computer science. All emergency science students take courses such as meteorology, statistics with aviation applications, and computer and network technologies. Upon completion of the program, students receive a National Fire Academy certificate. Learners can complete the entire emergency science curriculum online. Optionally, they can develop research projects through ERAU's partnerships with the Aircraft Fire Fighting Working Group and the Dallas/Fort Worth Fire Training Research Center. Distance students can take advantage of many student services, including career support and library resources. The BS in emergency science curriculum holds recognition from the Fire and Emergency Services Higher Education initiative, a U.S. Fire Administration program. Based in North Carolina, Fayetteville State University is a public institution offering over 70 degrees at the bachelor's and master's levels. FSU's BS in fire and emergency services administration holds certification from the Fire and Emergency Services Higher Education initiative, making it one the best online fire science degree programs. Through the program, students build their overall management skills and develop strong problem-solving and critical thinking abilities. The core fire science curriculum includes a course on managerial issues in an all hazards environment. The course explores aspects of management including regulatory issues, contingency planning, and program evaluation. Students also take a course that examines the political and legal foundations of fire prevention. They learn about the American legal system and the government's role in public safety. FSU's program instructs students on the technical aspects of fire safety. A course on fire dynamics covers combustion, flame spread, and smoke movement. The class also explores physics and chemistry principles associated with fire and combustion. The fire science program requires 122 credits from associate-level coursework, general education courses, core fire science classes, and electives. FSU administers the degree as a 2+2 program, and applicants need at least 60 college credits and a 2.0 GPA to qualify. They need an associate degree in a fire science-related field or an unrelated associate degree combined with five years of fire service experience. Admitted students may transfer up to 90 credits toward the degree. Founded in 1908, the University of Nebraska at Omaha is a public research university that boasts over 200 undergraduate programs and more than 70 graduate options. UNO's College of Public Affairs and Community Service offers a BS in emergency management and disaster science that readies students to plan for, respond to, and recover from large-scale disasters. Students gain the necessary skills to collaborate with different agencies to address man-made and natural crises. BS in emergency management and disaster science learners take 30 credits through 10 core courses. They complete emergency management-oriented classes that deal with preparedness planning, disaster response, and emergency management communication. They also take public administration-focused courses, including one on applied statistics and data processing in the public sector. Learners complete the remainder of major requirements through two, 15-credit concentrations. The fire service management specialization stresses fire safety and technology along with the role of fire services in emergency situations. The five required concentration classes cover topics like building codes, fire prevention organization, fire strategy, and analytical approaches to public fire protection. Distance learners can select from six additional online concentrations, including criminology and criminal justice, information technology and communication, and public administration and management. Another interesting online concentration, tribal management and emergency services, teaches students about tribal government and law. Outside of major-specific coursework, students complete 40-46 general education credits. They take classes like writing, public speaking, fine arts, natural sciences, and social sciences. In addition, the school requires two courses on diversity that promote a greater cultural understanding among students. Colorado State University is a large public research institution that educates over 30,000 students through more than 50 academic departments. CSU Online offers 10 bachelor's programs, including one of the best online fire science degrees. Students complete the fire science program entirely online in a self-paced format. While learners may earn the degree in two years, most students finish the curriculum in 3-4 years by taking two courses per semester. CSU recommends that students spend 9-12 hours per week on each three-credit class. The BS in fire and emergency services administration requires 120 credits. Students take 11 core fire and emergency services classes that build on their technical training and prepare them for advanced roles. Core courses ready students to lead organizations by covering topics like human resources, budgeting, and proposals. The core curriculum also includes a unique class on trends in fire science technologies that introduces learners to emerging fire science technologies and teaches them to implement new tools within their organization. Learners take six additional fire service credits along with 23-24 credits of electives. The school recommends electives such as economics of public finance, political communication, and public relations. In their last semester, students participate in a capstone management simulation. During the simulation, students integrate their administration and management skills to address a fire and emergency services situation. Applicants require significant college experience or an associate degree to qualify. They may transfer 40-64 credits toward the degree. All prospective students need at least three credits in mathematics and a 2.0 GPA. Based in Richmond, Kentucky, Eastern Kentucky University offers over 40 online undergraduate, graduate, and certificate programs. EKU's undergraduates can pursue an online BS in fire protection administration that holds accreditation from the International Fire Service Accreditation Congress. The fire protection administration bachelor's boasts a 120-credit curriculum that prepares students for roles as fire marshals, fire chiefs, and hazardous materials specialists. The curriculum boasts 66 credits of core courses that discuss topics like fire behavior, prevention, and dynamics. The core coursework also includes classes on technical writing, occupational safety, and building construction. Students can complete the entire fire science degree online through Blackboard. The school offers online classes during two, eight-week terms each fall and spring, along with two, six-week summer sessions. Online classes typically incorporate video lectures, discussion questions, quizzes, and exams. Distance learners can take advantage of dedicated student services like online tutoring. The Student Success Center assists learners with their coursework and study habits. Online students can log on to SmartThinking for one-on-one tutoring and asynchronous essay help. EKU also offers subject-specific online tutoring in areas like math, psychology, and writing. Admitted students may transfer up to 90 credits toward the fire protection degree. Applicants interested in fire science might also consider EKU's fire, arson, and explosion investigation bachelor's, which requires two weeks of on-campus coursework at the EKU Fire Labs. All online students pay the same tuition rate, regardless of whether they live in Kentucky or out of state. A private institution based in Fayette, Iowa, Upper Iowa University serves over 3,000 students through its distance education programs. Students who pursue UIU's online BS in public administration build the skills they need to effectively administer, develop, and oversee public programs and organizations. They can choose a general track or a concentration in emergency management, law enforcement, policy and politics, or fire science. The fire science concentration builds on prior experience in the field and teaches students about the management and social science aspects of fire science. Students approach fire science from a public administration perspective, learning to plan and manage public policy projects. Coursework covers topics like public budgeting, business law, and management principles. Learners earn the public administration degree entirely online through asynchronous courses. They take classes during five, eight-week terms along with an accelerated, six-week summer session. The public administration program boasts an instructor-paced format, and students must participate online four days per week. Distance students can take advantage of online tutoring, digital library materials, and other resources. Through UIU's learning management system, distance learners access NetTutor, a free online tutoring service. The university library provides online databases, eBooks, and articles. Additionally, students can email assignments to the writing center to receive feedback within 48 hours. For admission to the fire science emphasis, students need an associate degree in the field, experience in a fire science academy, or 15 credits of related coursework. The program lists six start dates per year. Founded in 1919, Siena Heights University is a Roman Catholic institution that educates around 2,500 students through approximately 100 undergraduate and graduate programs. SHU offers nine online degree completion options, including a unique bachelor of applied science program. SHU students can pursue a bachelor of applied science in healthcare professions, technical and occupational professions, specialized occupational professions, and public safety professions. The career-focused BAS boasts an inverted major structure, with students completing a custom major that centers around occupational training that they already completed. Most BAS students do not need any additional training from SHU. Instead, they complete liberal arts coursework and other classes to meet the requirements for a bachelor's degree. Students who pursue the public safety professions option include learners trained in law enforcement, fire technology, public safety, and paramedic technology. Students can establish their major through courses they completed at accredited colleges along with technical and trade schools. To graduate with a BAS degree, students must present a major and complete all liberal arts requirements. BAS students need to take at least 30 credits at the 300 or 400 level, including at least 15 credits of upper-division coursework at SHU. Learners must maintain a 2.0 GPA to graduate. Admitted students can transfer in up to 90 credits from other accredited colleges. Students complete their BAS online through eight-week courses. Distance learners gain access to online academic advising, library resources, technical support, and degree planning help. Based in La Grande, Eastern Oregon University is a public institution in operation since 1929. The school offers around 40 web-based majors, minors, certificates, and graduate degrees, including a fully online BS in fire services administration. The bachelor's in fire services administration includes a 15-course core curriculum that instructs students in the technical and managerial aspects of fire services administration. The program incorporates classes on fire protection hydraulics, building construction for fire prevention, and fire investigation and analysis. Administration-focused coursework prepares students for roles as supervisors in fire departments and private fire protection agencies. Students take courses dealing with fiscal management, political and legal foundations of fire protection, and personnel management in emergency services. EOU constructed the fire services administration program in accordance with Fire and Emergency Services Higher Education curriculum standards. EOU's fire services administration program boasts a fully online delivery. Online learners work one on one with an academic adviser to plan their program. In addition, through the EOU writing center, students can meet online with a tutor for writing help. The university also provides synchronous and asynchronous eTutoring in several subjects, including accounting, statistics, and economics. Freshmen applicants must submit official high school transcripts and ACT or SAT scores. EOU automatically admits students with a 2.75 GPA who satisfy all other requirements. Transfer students need at least 30 transferable credits and a 2.25 GPA. EOU maintains transfer partnerships with community colleges in Oregon, Washington, Idaho, California, and Texas. Founded in 1854, Salem State University is a public institution that offers 32 undergraduate programs to around 7,000 undergraduates. Salem State's Berloton School of Business delivers an online bachelor's degree completion program in fire science. Students enter the BS in fire science administration program with an associate degree from an approved fire science program. In their associate-level coursework, students explore the basics of fire technology. The degree skips over the technical aspects of fire science and instead stresses fire protection administration. Major coursework consists of 45 credits. Learners complete 21 credits through their associate program and 24 credits at Salem State. Major core courses discuss management-oriented areas like leadership, fire service law, and emergency scene management. In a course on managing community-based fire prevention programs, students examine case studies to learn about local and state codes, public education, and the business of fire prevention. In advanced arson detection and prevention, learners explore fire investigation strategies. Along with major-specific courses, students take required support courses in management theory, economics, sociology, and business calculus. Salem State also requires all undergraduates to take a course on diversity, power dynamics, and social justice. Applicants need to submit varying requirements depending on the number of college credits they earned. For example, applicants with 24 or more college credits need at least a 2.0 GPA. Applicants with less than 24 credits require either a 2.5 or 2.0 GPA and other materials. Based in Jersey City, New Jersey City University is a public institution established in 1927. The school boasts several hybrid and fully online programs, along with over 500 undergraduate and graduate online classes. Undergraduates can pursue a hybrid BS in fire science. The fire science major curriculum requires 30 credits. Students take 10 core courses that cover topics like firefighting strategies, hazardous materials, and building construction. The program begins with fire science basics, teaching students the fundamentals of engine company operations, and ladder company operations. The program prepares students for advanced roles through management-oriented classes on fire department organization and fire company officer management. Learners also complete 15 credits of electives. One interesting elective on transportation and industrial fire hazards explores the various hazards presented by different industries. NJCU's students earn a bachelor's in fire science through a combination of online and on-campus courses. Applicants must submit high school transcripts and an essay describing their reasons for choosing NJCU. The university also considers class rank along with SAT and ACT scores. Additionally, most freshmen must take a placement test before enrolling in classes. Students with adequate SAT scores may not need to take the placement exam. Applicants with more than 12 college-level credits apply as transfer students. Prospective students with an associate degree from an approved New Jersey college and at least a 2.0 college GPA may satisfy the university's general education requirements. Texas A&M University-San Antonio is a public university that serves close to 6,500 students through 26 undergraduate degrees and 13 graduate programs. The university's College of Business offers a bachelor of applied arts and sciences in fire and emergency services administration that provides the practical and theoretical skills that firefighters need to lead a fire service.The program boasts a multidisciplinary approach and draws from areas like public sector administration, management, and leadership. Graduates develop the ability to think critically and analytically about fire prevention strategies and emergency services. The fire and emergency services curriculum includes typical fire science courses dealing with areas like fire prevention organization, community risk reduction, and disaster planning. However, the curriculum also incorporates some unique classes. One class, developing data-based outcomes for fire and emergency services, prepares students to evaluate employee performance and propose data-driven solutions. A course on terrorism, homeland security, and weapons of mass destruction covers terrorist groups, terrorism trends, and the fire service's role in responding to homeland security threats. Overall, students complete 36 credits of major-specific courses. They also take 42 general education credits, up to 42 technical/vocational credits, and support courses. Students complete the bachelor's degree in fire science online. Students who enter the program with an associate degree can complete upper-division coursework in six semesters, including summer terms. They take two courses each semester to finish the major curriculum in two years. Current Texas firefighters that enroll in the program receive a tuition exemption. Anna Maria College is a Catholic liberal arts institution based in Paxton, Massachusetts. The small college boasts over 35 undergraduate programs and more than 22 graduate programs. The school offers three fully online programs, including a bachelor's degree completion program in fire science. The fire science program comprises 60 credits. Students take six exploration courses, including quantitative reasoning, Catholic worldview, and U.S. in the world. They also complete 30 fire science credits through 10 required courses such as legal aspects of emergency services, fire investigation and analysis, and fire-related human behavior. Learners satisfy the remaining credits through four fire science electives. Anna Maria delivers the BS in fire science entirely online in an asynchronous format. Students take online classes in eight-week terms and usually complete one class per term to earn the degree in just over three years. Anna Maria boasts a fifth-year option that enables fire science students to earn their master of public administration by studying for just one additional year. Students who opt for the accelerated master's degree option take three graduate-level courses in their last year of undergraduate study while paying the undergraduate tuition rate. Anna Maria's MPA features a fire and emergency services specialization that prepares students for executive-level roles in the fire and emergency services industries. Applicants need an associate degree or 60 transferable college credits to qualify. They also must submit transcripts and demonstrate a 2.0 GPA. Selecting a concentration allows students to personalize their fire science degree and gain a deeper understanding of a particular focus area. While schools tend to offer concentrations that align with faculty expertise and student demand, many fire science bachelor degrees include the following specialization options. This concentration equips learners with the knowledge and skills needed to collect evidence, perform data analysis, and make critical forensic determinations based on findings. By exploring topics in fire safety and administration, candidates learn to draw connections between fire conditions and criminal law and investigations. Students who select this emphasis prepare to take on public administration roles by studying risk reduction, prevention management, and fire research. Coursework addresses fire service practices, leadership strategies, and public administration techniques. Exploring the intersection of fire safety and technology, this concentration emphasizes fire and rescue services' critical role in emergencies. Common lecture topics include inspections and codes, public fire protection, and prevention tactics. Students also learn to organize and manager fire prevention activities. While every school's fire science bachelor degree features a slightly different curriculum, most include certain foundational courses. These classes explore core concepts that are integral to any fire science degree. Regardless of which institution you choose to attend, you are likely to encounter one or more of the following courses. Fire Research: This class develops and strengthens fire-oriented research skills along with critical thinking and professional writing competencies. Candidates explore the processes involved in designing and performing original research, as well as data analysis techniques. Lectures address concepts such as structural fire safety, fire test standards, and personal safety for firefighters. Fundamentals of Emergency Management: Coursework addresses the many challenges related to emergency services and the complications created by taking an all-hazard approach to emergency management. Learners survey disaster phases and the evolution of U.S. disaster policy, gaining the problem-solving skills needed to successfully handle earthquakes, floods, fires, and terrorist activities. Psychology of Disaster: Offering a broad survey of emergency-oriented psychological trauma, this course examines disaster's short- and long-term effects on both responders and victims. Candidates learn to assist individuals affected by post-traumatic stress disorder and employ critical incident stress management techniques. Emergency Services and Fire Administration: This class introduces crucial emergency management leadership and administrative skills, including budget development, collective bargaining, and effective risk reduction strategies. Students also learn to influence public policy and collaborate with government entities on the local, state, and federal levels. Political and Legal Foundations: Fire service professionals face numerous political and legal matters on the job. This course addresses common legal practices related to fire service, including employment matters. Candidates examine the processes used to draft and enforce fire codes, as well as how their efficacy is measured. Earning a fire science degree online introduces and builds upon important professional skills. Candidates strengthen their understanding by reviewing fundamental topics in fire science, explore advanced and specialized concepts, and learn to synthesize and apply their knowledge in real-life settings. Students learn to collect evidence, analyze information, and make data-driven decisions based on their findings, using logic to explore potential benefits and risks. By assembling and leveraging the necessary tools, prospective fire science professionals learn to prevent and resolve complications in the field. Graduates are able to handle challenges in a variety of settings and situations. This skill allows professionals to develop and execute efficient, effective long- and short-term plans. Strategic planners carefully consider the resources required to achieve their intended results. Strong communicators are able to deliver clear, focused messages, both orally and in writing. allows you This skill allows fire science professionals to express ideas in a way that others understand them, even in critical situations. Skilled project managers can clearly plan and articulate a project's trajectory from start to finish. They successfully budget for and obtain the necessary human and fiscal resources to fulfill their plans and carefully monitor and assess team progress. How Long Does It Take to Get an Online Bachelor's in Fire Science? On average, a fire science bachelor degree consists of around 120 credits, including general education, major-specific, and elective classes. While full-time students often finish their degree in four years, part-time candidates may spend an extra year or two on their studies. Some institutions provide college credit for professional experience, or allow students to transfer credits from other institutions, which may further shorten a program's duration. Program length also depends on delivery format and structure. In cohort-based programs, a student group progresses through the curriculum together. While the cohort learning format offers more faculty support and collaborative opportunities than self-paced programs, cohort classes often take longer to complete. In contrast, asynchronous coursework may be completed at the student's convenience, and accelerated degrees permit candidates to finish their studies as quickly as they like. Internship or practicum requirements may also add significant time to a degree. Selecting an accredited fire science degree is crucial to obtaining a top-notch education. Accreditation demonstrates a school's commitment to offering high-quality, rigorous curricula and maintaining excellent academic and ethical standards. Colleges and universities may hold regional or national accreditation, depending on the agency that assess them. Regional accrediting agencies include organizations like the Southern Association of Colleges and Schools and the Middle States Commission on Higher Education, and typically evaluate public, nonprofit universities. Most nationally accredited schools are private, for-profit vocational institutions. Regional accreditation is generally considered to be more prestigious, and credits earned from regionally accredited schools transfer easily between programs. In addition to regional and national accreditation, some programs hold field-specific, programmatic accreditation. Agencies like the International Fire Service Accreditation Congress (IFSAC) evaluate emergency-oriented college curricula and fire science certification programs. Many employers prefer to hire candidates with degrees from IFSAC accredited programs. While it does not accredit schools or programs itself, the U.S. Department of Education promotes robust educational standards and access to quality education for all learners. This government branch maintains a comprehensive list of accredited schools and programs on its website and collaborates with the Council for Higher Education (CHEA) to recognize high-quality institutions. through some 60 accrediting organizations. Comprised of representatives from over 3,000 colleges and universities, CHEA monitors accrediting agencies and advocates for high academic standards. CHEA's website is home to an international database of recognized accrediting bodies and accredited institutions and programs. Fire prevention, suppression, and investigation is considered a "recession-proof" industry due to the consistently high demand for qualified fire professionals. The Bureau of Labor Statistics (BLS) projects steady employment growth in the field. The following table looks at industry projections for some of the most common careers in fire science. Despite the inherent danger of fire containment and suppression, firefighting is actually considered one of the nation's safest jobs. According to CAL Watchdog, 2.5 out of every 100,000 firefighters are killed in the line of duty. By comparison, the national average for all professions is 3.5 deaths out of 100,000 employees. According to the BLS, the median annual salary for all protective service occupations in 2017 was $39,690. However, numerous factors influence earnings, including your specific job title, experience, and geographic location. The following table explores salary expectations for different positions in fire science at four key career benchmarks. Of the five careers listed on the table, fire protection engineers saw the highest rate of career salary growth, with an increase of roughly 66% between entry-level jobs and late-career. Fire inspectors enjoy the second highest career salary growth at 58%, followed by firefighters and emergency management specialists at around 52%. Students who graduate from college with an online bachelor's degree in fire science qualify for dozens of positions. Below, we take a look at five common career paths for degree-holders in the field. Students who graduate from college with an online bachelor's degree in fire science will be qualified for dozens of positions. Below, we've covered five of the most common career paths for degree-holders in the field. Firefighters: Firefighters respond to fire-related emergencies that threaten human lives, property, or natural resources. All firefighters require rigorous training, and job candidates should expect to face stiff competition. Of the roughly 327,300 urban and forest firefighters in the United States, the BLS estimates that approximately 92% are employed by local, state, and federal government agencies. Fire Inspectors: Fire inspectors investigate urban and forest fires to determine the cause, origin, amount of damage, and any measures needed to mitigate further destruction. They also inspect buildings, civic structures, and other areas to ensure they follow fire code requirements. The BLS notes that roughly 87% of fire inspectors work for local, state, or federal government agencies. Emergency Management Directors: Emergency management directors oversee teams that develop contingency plans for fires and natural disasters, as well as response and relief efforts when emergencies occur. They often collaborate with elected officials, government agencies, nonprofit organizations, and other entities to ensure that emergency operations run smoothly and efficiently. Roughly 64% of the nation's emergency management directors work for local or state government agencies. EMTs and Paramedics: EMTs and paramedics respond to emergency situations where human lives are at risk. They are trained to administer CPR, first aid, and other life-saving techniques to the sick and injured. They also provide transportation for medical patients requiring further medical attention, and keep records of everyone that they assist. Hazardous Materials Removal Workers: Hazmat workers identify, handle, and dispose of lead, asbestos, chemical waste, and other toxic materials that pose a threat to human health and safety. They also assess the threat these materials pose to human life, property, the environment, water supplies, and other important resources. Firefighters $49,080 Most paid firefighters must complete a set amount of training (usually a few months) offered by their local fire department or local, state, or federal agencies. Fire Inspectors $56,670 While requirements vary by state, most fire inspectors receive a combination of classroom-based and onsite practicum training. Emergency Management Directors $72,760 Some states expect these employees to complete specialized training and earn certain professional certifications, such as the Certified Emergency Manager credential. EMTs and Paramedics $33,380 All states require EMTs and paramedics to obtain licensure. In many states, certification from the National Registry of Emergency Medical Technicians (NREMT) satisfies these guidelines. Hazardous Materials Removal Workers $41,400 Hazmat workers in most states must undergo at least 40 hours of OSHA training and enroll in classes on nuclear waste and radioactive materials. Making connections and learning more about fire science is crucial to your professional success. Professional organizations offer a great entry point for students who want to learn more about their chosen career path. Below you'll find three of the country's most prominent organizations established for fire science professionals. These organizations host networking events, provide online trainings, maintain active job boards, and offer other services for career-ready college graduates. International Association of Fire Fighters: The IAFF represents more than 300,000 firefighters and paramedics in the U.S. and Canada. The association's website includes job listings, video tutorials, and an extensive resource library. International Association of Women in Fire & Emergency Service: Founded in 1982, i-Women today represents more than 110,000 female firefighters and fire personnel in the United States. Membership benefits include discounted conference fees, trustee and mentorship opportunities, and a complimentary subscription to the association's online magazine. U.S. Fire Administration: This government agency is home to the National Fire Academy, as well as the Fire and Emergency Services Higher Education board. The website also features links for employment and grant opportunities, as well as an online fire science publications database. Despite online programs' relative affordability, most students still seek some form of financial assistance. All learners should complete a Free Application for Federal Student Aid (FAFSA) form to learn more about loans, grants, and other opportunities offered through the U.S. government. Additionally, private grants and scholarships are widely available through nonprofit organizations, companies, and other sources. Check out the resources below to learn more about financial aid options. While financial aid for online learners is equivalent to that for campus-based learning, this hasn't always been the case. Learn about recent changes to financial aid policies, as well as the different funding opportunities available to online students. Online programs provide an affordable and flexible option for women trying to balance the demands of work, family, and earning their degree. We've curated a list of valuable scholarships specifically for women. Online college programs present a flexible, affordable choice for single parents who are interested in earning a degree and securing their family's financial future. This list contains scholarships, grants, and other financial aid options geared toward single moms and dads. Millions of dollars in free educational funding is available to U.S. military personnel, but much of it goes unused. Learn more about grants, scholarships, and other financial aid opportunities available to veterans, active-duty service members, and reservists.